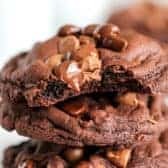 These Chocolate Cookies are thick soft and chewy with a triple load of chocolate! These will quickly become your favorite chocolate cookies ever! Stir together flour, cocoa, baking soda, & salt. Set aside. Cream together butter, shortening, sugar, eggs, and extracts until fluffy. Mix in flour mixture. Drop 1 tablespoon per cookie onto an ungreased cookie sheet and bake 9-11 minutes.